Peter Vitalone’s 2012 release One of Us was an incredibly diverse record that showcased the keyboardist and singer/songwriter’s ability to assemble a cast of capable musicians behind him as well as take center stage and make use of his own talents. With songs that touched upon everything from traditional rock ‘n roll to blues and pop, it was the type of release that seemed to offer something different with every moment. For the follow up This Side of the Dirt, Vitalone’s gone for a slightly more focused approach and honed in on the blues and folk rock styles with some of the other genre elements still making appearances in a subtle manner. Not only does it feel slightly more cohesive as a whole in comparison to One of Us, but it’s a natural step forward for a singer/songwriter who has already covered a lot of ground but has chosen which elements he really wants to push even further. Don’t get me wrong, as I mentioned in my review of One Of Us Vitalone’s decision to branch out so much ended up working to his advantage, as there were plenty of great hooks spread across multiple genres. But if that record served as his debut so to speak (there are some older solo endeavors according to the discography page on his website but they don’t seem to have been widely released), the decision to hone in on a few different styles for a sophomore release seems like a good decision. Compared to its predecessor, This Side of the Dirt starts off with a lot more energy as “Into Me I See” puts Vitalone’s keyboards front and center for a song that has pop hooks with a blues undertone while “Everyday is Yesterday (Down South) fully embraces the blues/roots rock territory. This increase in energy and the swagger of the instrumentals made this album have a lot more oomph right from the start, and it immediately draws you into everything Vitalone and his supporting cast has to offer. The rest of the This Side of the Dirt balances grittier keyboard and guitar playing with softer pop hooks, and though there is a bit less ground covered stylistically this time around the increased focus makes each song truly stand out. It also feels like there’s a better flow to the entire thing, as the softer ballads are held back until the middle/end of the record and transition more naturally into their upbeat counterparts. I also like the fact that the keyboard playing seems even more prominent, as they’re at the front of almost every song and serve a larger role than before. One Of Us not only gave Peter Vitalone to showcase his skills as a songwriter, but also to display his vocal ability which wasn’t something that he had contributed to a lot of the previous projects he was involved in. His style hasn’t changed much in the years that have passed between the two albums, but that’s certainly not a bad thing as the balance of grittier singing on the bluesy songs and softer ranges works perfectly. It does seem as though he has some additional range that he’s been holding out on listeners though, as “Another Night Fallen” really caught me by surprise the first time I heard it. On this particular song Vitalone goes for a soft, emotional ballad and pushes his voice into some higher registers that are sure to really strike a chord with listeners. On some of the other arrangements he is once again supported by some able backup singers, but even more so than before Vitalone’s really in the spotlight here and showcases more of his range to leave a lasting impression on those who spend time with this record. 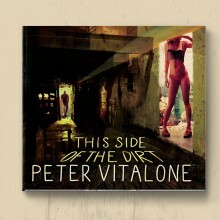 This Side of the Dirt is exactly the type of album that Peter Vitalone needed to release after a strong release like One of Us. It takes the best elements of that effort and brings out their finer details even further, resulting in energetic blues/Americana type hooks and emotional soft ballads that are sure to appeal to quite a few listeners. There’s also a more natural flow from one song to the next and as a whole this one never drags which is definitely not an easy feat, and if you have yet to experience what Vitalone has to offer and any of the genre tags on this one strike your interest definitely check this album out.